Twproject includes a complete agenda, capable of synchronization with several e-mail clients (Outlook, Entourage, Mail, iCal, Google calendar etc.). Twproject smoothly integrates the workgroup agenda, meeting management, and external calendars visualization. Every event has an author, a subject, description, location and type (at least), some flags, plus its schedule. 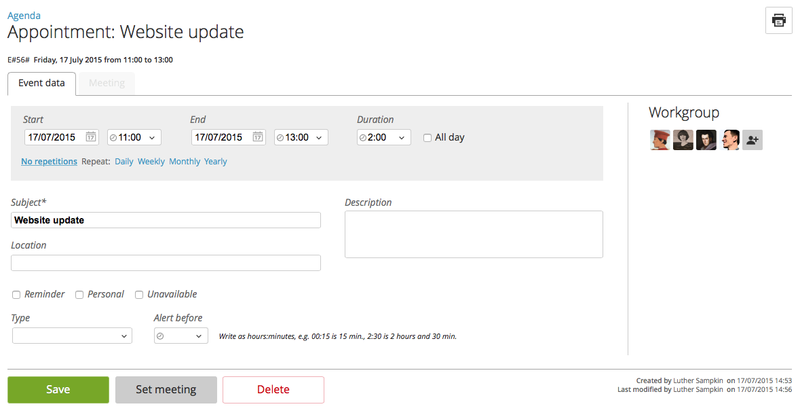 The event type field is used for filtering events, but it is not mandatory. Usually we check “reminder” when you want to remember something seeing it on the agenda, without “covering” a time interval. Marking an appointment with the “personal” flag will hide its description to everyone (except you of course). Your colleagues will see that you are not available in that time interval, but they do not know why. “Unavailable” means that you are not available for working. Unavailable events are reported on operator load and on plan on pink color. It is usually used for personal vacations (not company’s holidays). 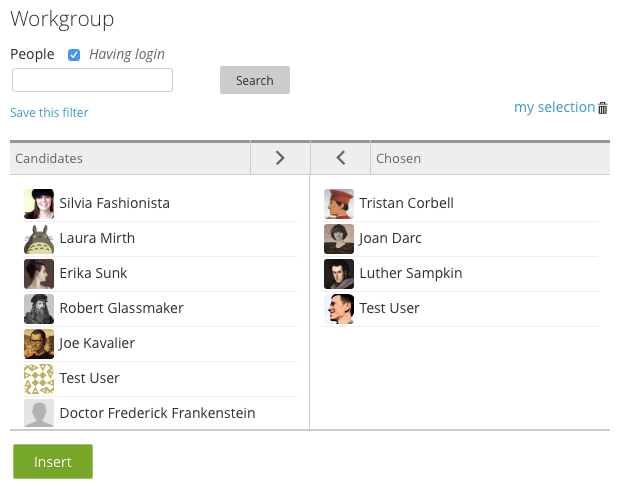 Enabling the “meeting” checkbox will open the meeting management section after saving; we will see it in detail later. If you are configured to synch with external iCalendar clients (Outlook, iCal, Google calendar etc.) in your options, you can set even the alert time (e.g. Outlook’s remainder). You can add someone else to an event by clicking on the button on the “attendees” section. 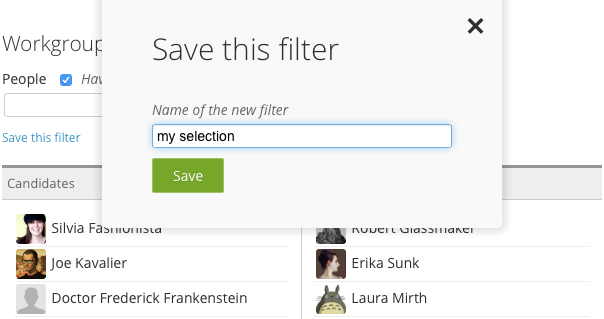 Insert a filter or just press search to find candidates, then select one or more candidates and move them to selected. Additional searches will refresh the candidate part only, so you will not loose the current selection. When the legenda is on, you are working on a “workgroup” agenda, so for instance if you add a new event, by default the attendees are pre-filled with the current ones, and you can change them. The green box is the period currently displayed on the screen, the blue bar means “today”. You may use daily or monthly views as well. Then there are filters by appointment type. You can add as many new types you need by clicking “event types”. The usual workgroup buttons will allow you the see the agenda of other resources; we’ll get back to it later. The red line on the plan is the current time. 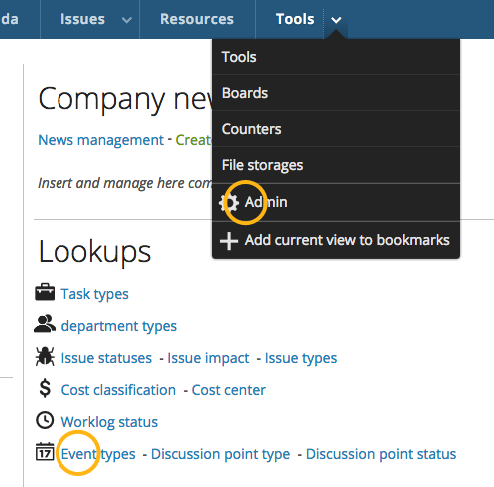 If you hover the mouse on the plan and drag you will add new appointments, at the time where you were hovering. 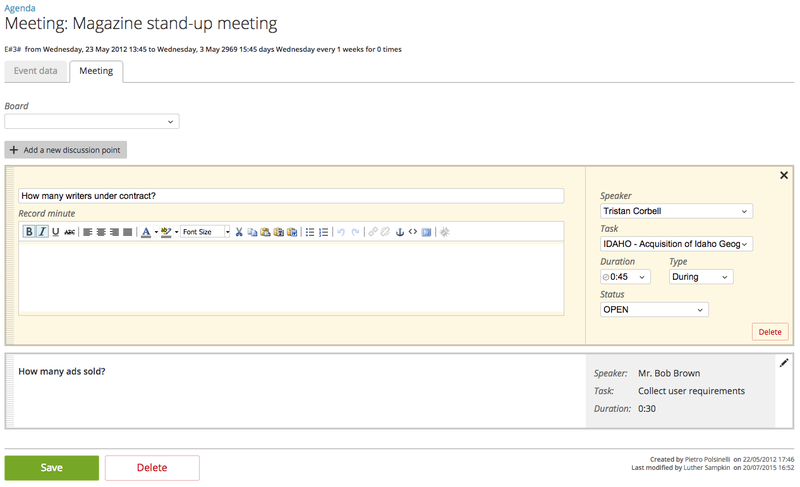 A meeting in Twproject is an event linked to a section that manages discussion points and meeting minutes. Each discussion point is constituted by a type, a speaker (a resource), a title, eventually a task subject of the discussion, and a minute, which is a part of the total one. You can write an html text, and paste images as well. This is a long text field so you have no limitation on text size. You can print the meeting report, export it to PDF or send it by e-mail, as usual.